Create the space you need and maximize the entire cubic area of your facility with a Cubic Mezzanine. The most cost-effective way to turn unused cube into usable productive space. 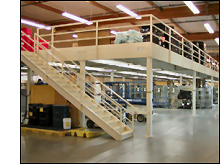 Cubic Mezzanines can be designed around equipment, building columns and other obstructions to fit your area exactly. Cubic Mezzanines are custom designed with CAD technology and backed by a lifetime structural warranty. 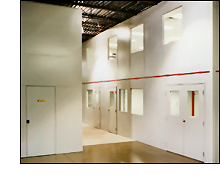 Cubic Mezzanines are customized to fit your exact area, height and load requirements. Create new production, office, storage or assembly space, locker rooms, parts departments, stockrooms, cafeterias, company records storage, work platforms, distribution centers and more. Choose from single or multi-level designs customized to your specific application. 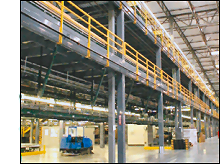 Add a vertical lift, rack, shelving, carousels, conveyors, in-plant offices - whatever you need to help you maximize your cube and improve building usage. Our engineers can also custom design SafetyRail, HandRail and Stairways. Our CAD system speeds the layout process, simplifies changes and ensures accurate drawings. We have developed the engineering expertise and support services necessary to meet total customer satisfaction.